Snear Miller’s “Val Cartier” in 2016. I could have walked the 30 seconds to shoot it myself, but Google Maps provides. It was a nice morning, at least. Image: Google Maps, 2016. Interest-based research is a wonderful thing. Something catches your interest, you ride it out, put it aside. It’s that last part that really gets you. All that effort should, really, result in something. At least a poorly-written blog post, if not something more substantial. This has been one of my peskier issues. In 2016, I presented a paper at Carleton’s Underhill Colloquium. Or, at least, I should say partially presented a paper, as brevity is not one of my strengths. In any event, it was about the construction of apartment buildings in Centretown during the Depression. I’ve written about the topic in bits and pieces since then,1Including in Heritage Ottawa‘s much-awaited book on apartments, to be released this winter. but never really saw it through otherwise. In the interim, some of the buildings and topics have been explored by others, including a great piece on Snear Miller’s activities in the neighbourhood by Robert Smythe last spring. The Abancourt was willing, but not able. Image: geoOttawa, 1928. The Val Cartier, a Cecil Burgess design, which stands at the south east corner of Somerset W and Cartier, was Miller’s first real move in apartments as the Depression took hold. 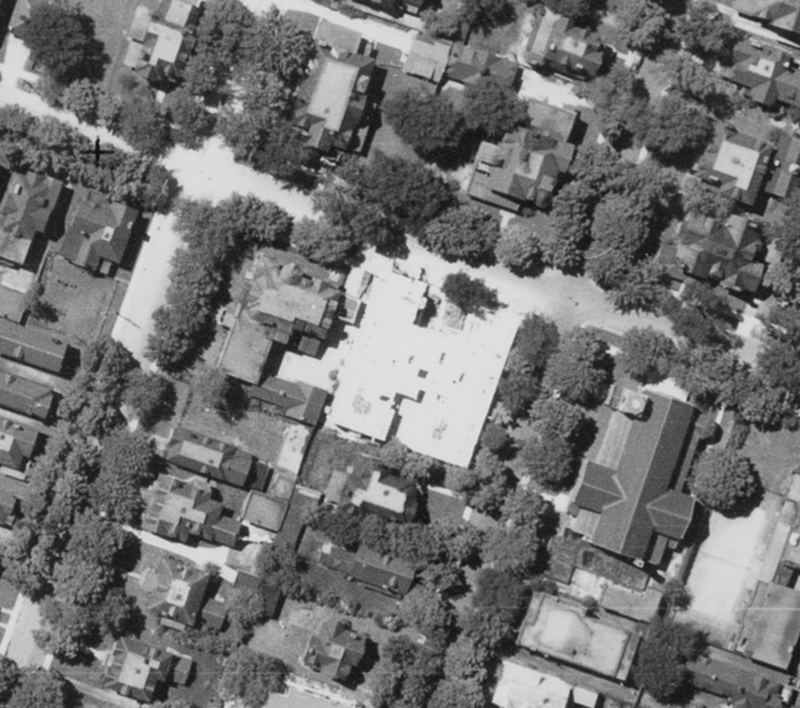 He purchased the double lot in 1930, which had already been cleared and prepared for development, for $8,500.2Ottawa Land Registry Office, Abstracts, Lots 4 and 5, East Cartier, Plan 15558, Reel 4AR121. Under construction in 1931. West is to the top, and St. Theresa’s RC Parish is the pointed roof to the right of the construction site. Image: NAPL Flight A3332 Image 71. What is known is that the site had already been prepared for the construction of an eight-storey apartment named the Abancourt. What is also known is two other things: (a) the Abancourt was never constructed, and (b) it’s the only apartment from the 1920s that I’ve seen that experienced any considerable community opposition.3“Commenced Work on New Apartment,” Ottawa Journal, May 21, 1927, p. 5; “City Issues Permit for New Apartments,” Ottawa Journal, July 27, July 16, 1926, p. 2; “Permit Taken Out for $80,000 Block,” Ottawa Journal, March 27, 1931, p. 1. If you study local history enough, you come to see just how little a city’s larger newspapers fail to cover the minutia of a city’s neighbourhoods. It’s not a knock: citywide coverage necessitates that one pull up a little and take more of a macroscopic view of the situation. It was perhaps only explosive to the individuals writing in The Beacon. I love how comparatively fat that type ‘C’ is. Source: The Beacon [Ottawa], May 29, 1930, 8. I was recently at the Ottawa Public Library’s Main Branch looking through back issues of Centretown News on microfilm and came across a reel called The Beacon (Ottawa) (1929-1932). Curious, I had never really heard of the publication and decided to take a look. It threw many punches, but didn’t last a long time. 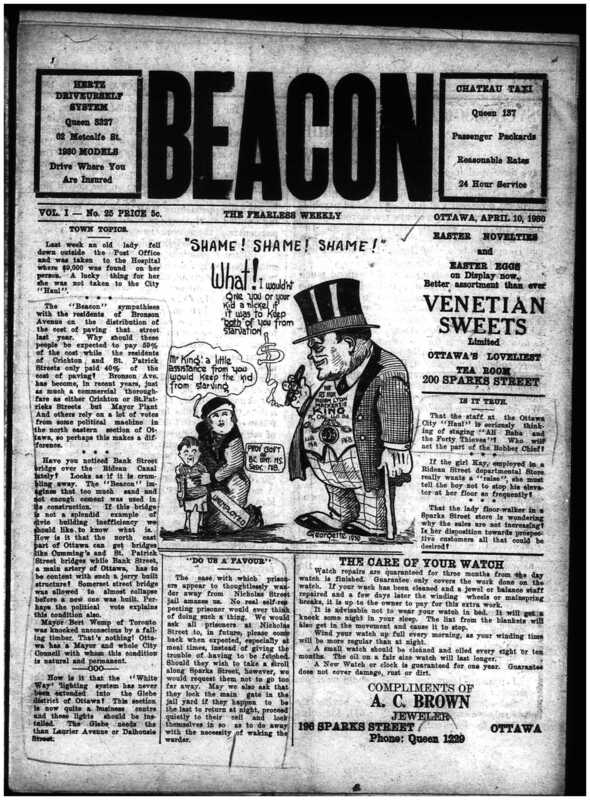 The Beacon ran from December 1929 through to July 1932 and disappeared without a trace. Source: The Beacon, April 10, 1930, 1. What I found was more-or-less a tabloid of its time. Populist, racist, and generally a product of its time, The Beacon appears to have been a forum for local cranks produced by a (mostly) anonymous individual or group of individuals who felt that no public expense was too small for outrage. 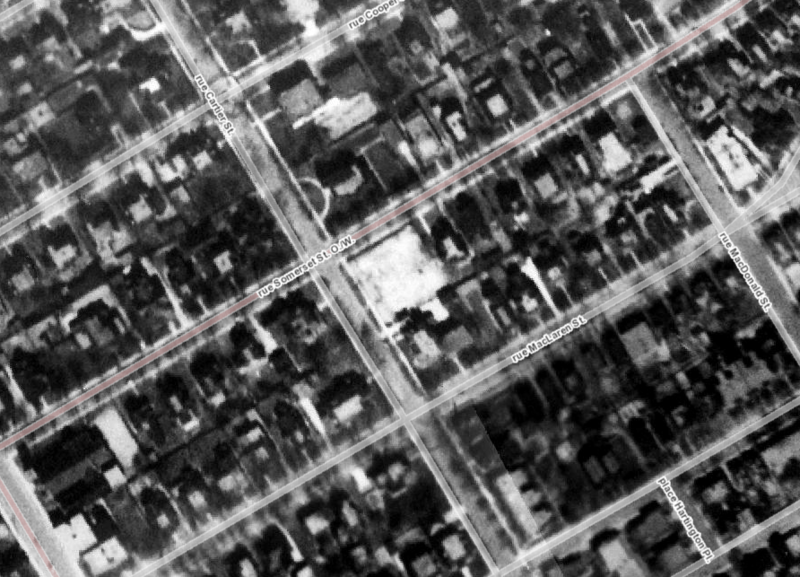 Its targets appear to have been chiefly Mackenzie King, Ottawa City Council, and any and all private enterprise which was seen to be profiting at the expense of others. Many editorials lamenting the state of Canadian immigration policy (too many non-British arrivals) and tales of Indigenous “danger” were published as well. Though my research on the publication itself is brief,4Involving a basic Google search and a Google Scholar search. there appears to be little – if any – information about it available. In any event, in May 1930, the Beacon ran a three-page investigative feature on the failure of the Abancourt apartments, a situation which it counted among examples of “legalized theft”5”The Porch Climbers,” (editorial) The Beacon, May 29, 1930, 4. and little more than a ploy to sell shares. In what would not be entirely out of place in a contemporary issue of the Sun or Frank, the Beacon’s favoured name for the project was the ‘I’ve Been Caught’ Apartments.6”Abancourt Apartment Fiasco,” The Beacon, May 29, 1930, 8. 1. ↥ Including in Heritage Ottawa‘s much-awaited book on apartments, to be released this winter. 2. ↥ Ottawa Land Registry Office, Abstracts, Lots 4 and 5, East Cartier, Plan 15558, Reel 4AR121. 3. ↥ “Commenced Work on New Apartment,” Ottawa Journal, May 21, 1927, p. 5; “City Issues Permit for New Apartments,” Ottawa Journal, July 27, July 16, 1926, p. 2; “Permit Taken Out for $80,000 Block,” Ottawa Journal, March 27, 1931, p. 1. 4. ↥ Involving a basic Google search and a Google Scholar search. 5. ↥ ”The Porch Climbers,” (editorial) The Beacon, May 29, 1930, 4. 6. ↥ ”Abancourt Apartment Fiasco,” The Beacon, May 29, 1930, 8.